Existing qualification exams will be divided into a single “core” exam, currently called the “Essentials Exam,” and then a “top-off” exam (Series 6, Series 7, Series 79, etc.). FINRA says this will reduce redundancy in the current exams. 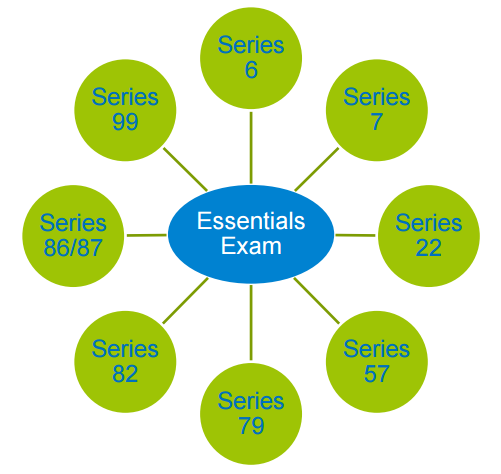 This means that if the Essentials Exam will be 100 questions long, the revised Series 7 will be approximately 150 questions. Currently, the Series 7 is composed of 250 questions. Content on the Essentials Exam will be stable and will cover core subjects such as the structure and functioning of the securities industry, the regulatory agencies and their responsibilities, basic economics, product knowledge (stocks, bonds, mutual funds), regulated and prohibited practices and professional conduct. The Essentials Exam will be different in that a person will not need to be associated with a member firm (you will not need to have a job in the securities industry) in order to take the Essentials Exam. Also, passing the Essentials Exam will be valid for four years. Current exams are valid for two years. FINRA hopes that non-registered employees of member firms will take the Essentials Exam and increase the level of industry knowledge among all employees. Passing the Essentials Exam alone will not be enough to qualify an individual to be registered. This means that the Essentials Exam will not appear in BrokerCheck, FINRA’s public online database of registered individuals and firms. FINRA says it’s building an enrollment management system that will permit people to take the Essentials Exam without using the U-4 and having to get fingerprinted. FINRA plans to maintain the 30/30/180 day rule for those who fail exams. Currently registered individuals will be grandfathered into the Essentials Exam and, if such a person leaves the industry, it would be valid for four years. FINRA hopes to launch the Essentials Exam and top-off exams in early 2017. FINRA is also considering retiring the Series 11 (Order Processing Assistant). Fun Fact: The FINRA qualification exam program began in 1956 with the Series 1 exam.